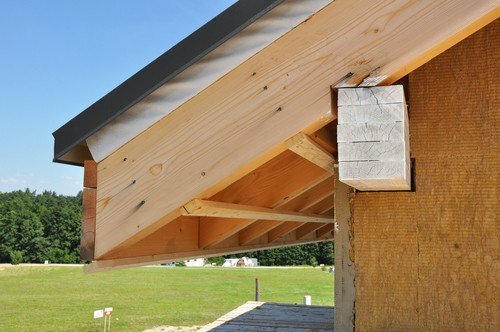 So one of the most important aspects of your chicken coop is proper ventilation. There are so many different ways that you can add windows to your chicken coop and there are TONS of different window styles that you can use. If you’re just starting out raising chickens, I highly recommend that you read my book about how to raise naturally raise chickens. 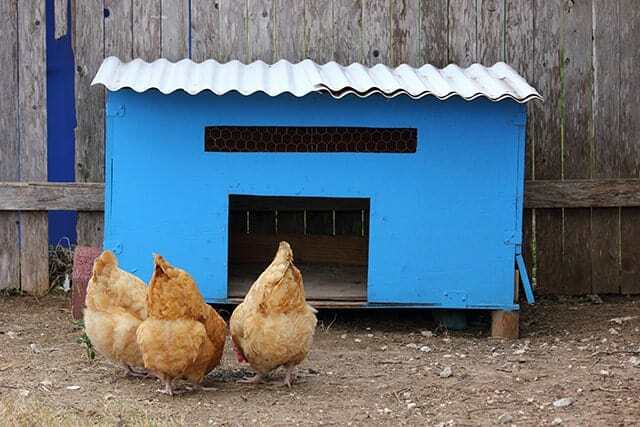 One of the most important things for you to do when adding windows to your coop is to make sure you have some way to protect your flock from the elements. These shutters are some of my absolute favorite! I love the idea of adding a colorful shutter to the window of your coop! This window is so cute too! I love how simple this window would be to make and how versatile the smaller, narrower window is for a smaller coop. Chickens have a very delicate upper respiratory system and so it’s very important that your coop has proper ventilation to avoid respiratory diseases in your chickens. Chickens also poop A LOT. And trust me if you don’t have windows in your coop, it’s not going to be pleasant for you or your chickens. I wrote an entire article about how you can add windows to your coop to help keep your chickens cool this summer. Adding windows is a great way to keep your chickens cool and make sure your coop has the ventilation it needs. I also love having windows and doors in my coop because it allows sun into your coop which can help your flock get the Vitamin D that they need. Vitamin D is important because it helps with calcium absorption which ensures your chickens have strong bones and healthy eggs! In addition to making sure my chickens get enough Vitamin D I also give them my chickens nesting herbs (I sell nesting herbs here in my store), so that they stay healthy and produce healthy eggs! So today I decided to collect some of my favorite chicken coop window ideas, so you can see how many different options there really are for windows for your coop! 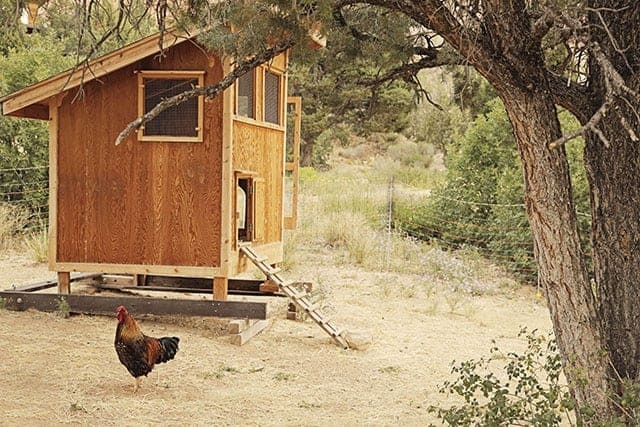 First off if you’re building a new coop check out my article about chicken coop plans! I’ve gather more than 50 chicken coop plans that are all free for you to use! I love all of these plans and they all have great ideas for windows for your coop! I give tons of detailed information in that book on how you can raise a healthy flock, that’s difficult to fully explain in a short blog post! So check it out! There’s nothing worse than a wet coop (and wet chickens) because you don’t have any way to cover your windows on your coop! In my coops, the roof overhangs over the side of the coop, so that when it rains water can’t get into the coop. But if you’re adding windows later on and your roof doesn’t overhang then I recommend you find some way to cover your windows. You could add a door or a shutter to your window that can easily be closed during a rainstorm. 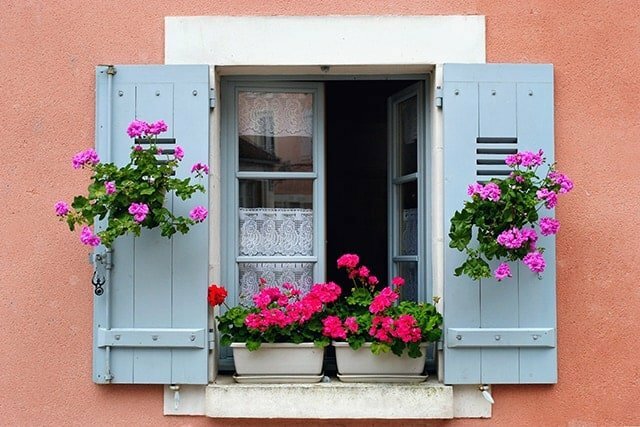 One of my favorite window ideas is adding shutters to your windows. I love how cute shutters are on windows, especially on chicken coops! Not only are shutters really cute, but they also are functional and can protect your coop from the elements during a storm! I think it’s a super cute way to protect your coop from the elements. I’m also a huge fan of window boxes. Check out my article here all about my favorite window box ideas for your chicken coop! I also really love these cute shutters on this coop! While these shutters don’t look like they are actually meant to be used, they do look so cute and would be so easy to add to your coop as a fun decoration! I love this idea of having a sliding door to cover the opening of your coop! This makes it so easy to close when the weather is bad or if you want to keep your chickens inside for a bit too! I’m also a huge fan of the cute windows in this chicken coop! This is a little bit fancier version of windows for a coop! There’s an actual glass window here that can be opened and closed to allow air in when needed and keep the elements out when needed! I also love that these windows have a screen on them! One of the biggest concerns I hear from readers during the summer is how to keep flies and bugs away from your chickens during the summer. I love the idea of using screens on the windows of your chicken coop to prevent insects from getting inside your coop. While this won’t prevent all bugs from getting into your coop, it will help so I think adding screens over your coop windows is a great idea to help keep some bugs away from your chickens. Because a screen won’t keep all of the bugs out of your coop I also recommend that you use herbs, such as citronella, lemon balm, and peppermint. I also have an amazing recipe for peppermint coop spray that does a great job of keeping bugs away during the summer. Don’t be afraid to use a window that isn’t the conventional shape. I think this window is great because with smaller coops it can be harder to add a full sized window. Especially since my chickens will try to fit through anything! This longer narrower window style prevents your chickens from getting out and predator from getting in! Traditional, but so classic for any chicken coop. I love the wood trim around the outside of the windows. I think it adds a really nice touch and is an easy way to quickly make a normal window look much nicer! Note the chicken wire on the window – that’s a great way to keep out predators! What have you done to dress up the windows on your chicken coop? Tell me about it in the comments below!